Wire JewelryThere are 26 products. Wire Jewelry is a special collection of jewelry, med from wire of different textures, dimensions, colours and materials. 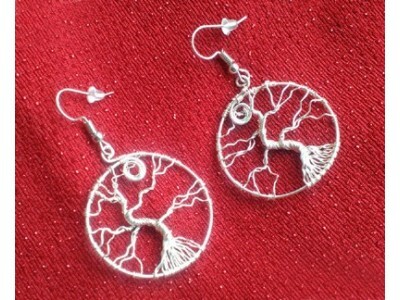 Sometimes, you will also find wire jewelry combined with some other materials, like polymer clay, wood, yarn and resin. If you would like to have some product custom made, write me here: info@unikatnica.com and I will reply you as soon as possible. This beautiful set of handpainted black and white butterfly bracelet, ring and earrings makes a beautiful and unique ooak gift for all women who like timeless and noticeable jewelry. The bracelet, earrings and the ring are unique in design. IMPORTANT! Before purchasing this Butterfly set of jewelry please register/log in to Uniktnica. OOAK violet handmade earring for women represent a lovely and timeless gift for women who value original and different gifts. These violet earrings are made of skin friendly materials and are nickle free. IMPORTANT! Before purchasing these earrings you need to register/logg in to Unikatnica (above right Log in). Important! before you purchase this beautiful pair of crocheted earrings with nine Swarovski crystals, logg in/sign in to Unikatnica. These handmade designer earrings with Swarovski crystals from Unikatnica are made of crocheted wire. Important! before you purchase this beautiful pair of crocheted earrings with seven Swarovski crystals, logg in/sign in to Unikatnica. These handmade designer earrings from Unikatnica are made of crocheted wire. Unique, handmade bracelet in violet&silver colour, with unique designer pattern. The designer wire pattern is handmade and skin-friendly, also all pellets. The bracelet is made from skin friendly materials which are nickle-free. Unique, handmade bracelet in light blue colour, with unique designer pattern. The designer wire pattern is handmade and skin-friendly, also all pellets. The bracelet is made from skin friendly materials which are nickle-free. Unique, handmade bracelet in cyclamen and gold colour, with unique designer pattern. The designer wire pattern is handmade and skin-friendly, also all pellets. The bracelet is made from skin friendly materials which are nickle-free. Unique, handmade bracelet in burgundy, with unique designer pattern of a flower. The designer wire pattern is handmade and skin-friendly. The bracelet is made from skin friendly materials which are nickle-free. Unique, handmade bracelet in silver-grey, with unique designer pattern. The designer wire pattern is handmade and skin-friendly. The bracelet is made from skin friendly materials which are nickle-free. Unique, handmade bracelet in black and silver-grey, with unique designer pattern. The designer wire pattern is handmade and skin-friendly. The bracelet is made from skin friendly materials which are nickle-free.